Many people spend a great deal of time at home engaging in activities with family, friends, and pets. It is therefore important to be aware of potential fire hazards within the home, and how to respond appropriately to dangerous situations. This section addresses home fire and burn hazards, and simple guidelines to avoid them. Candles are a popular way to decorate and celebrate, but they can easily ignite combustible materials. Use caution and common sense whenever using candles. Extinguish all candles before going to sleep or leaving the home. Keep candles away from items that can catch fire, such as flammable materials or liquids, clothing, books, paper, window curtains, etc. Use sturdy holders that will not tip over; make sure candleholders are non-combustible and big enough to collect dripping wax. Keep candles out of the reach of children and pets Use candles only with constant adult supervision. Nearly 100 children are severely burned every year while wearing sleepwear. Most of these burns occur while wearing either loose-fitting nightgowns or cotton sleepwear. Do not allow your child to sleep in a large, roomy T-shirt or other loose-fitting cotton garment. Children should wear tight fitting, 100% polyester sleepwear — (polyester is flame resistant, but 100% cotton or cotton/poly blends are flammable and ignite quickly). The kitchen is one of the most popular rooms in the home. However, it can also be the most dangerous room when it comes to scalds and burns. When cooking, it is critical to remember safety while using appliances such as your stove and/or microwave. Always be aware of children and keep them away from the kitchen while cooking. Turn pot handles to the back of the stove so they won’t be knocked off or pulled down. Wear clothing with tight-fitting sleeves – a dangling sleeve can catch fire easily. Keep stove surfaces free of clutter and grease build-up; Keep towels, pot holders, and loose clothing away from the oven. Check electrical appliances, plugs, and cords for exposed wires or frayed ends – replace if needed. If a fire starts in a pan on the stovetop, carefully place a lid over the burning pan, and then turn off the burner. NEVER pour water on an oil or greased fire! Provide CONTINUOUS supervision of children while in the kitchen! Keep the child at a safe distance from all hot items, including the stovetop, hot mugs, pot handles or appliance cords that could be pulled down by curious hands. Keep pot handles pushed toward the back of the stove. Always use caution when removing hot food from the microwave; scald burns are very common! After heating, allow food to remain in microwave until hot steam settles. DON’T use aluminum foil to cover items placed in the microwave! In the event of a fire, turn microwave off and unplug. Do not open door. Do not attempt to move. If fire does not go out, call 9-1-1. When fire strikes, quick thinking can save a life! It can take fewer than two minutes for smoke fumes to overcome a child or an adult. Plan now and create a Family Escape Plan for your family! If you sleep with your bedroom doors CLOSED at night, be sure to have a smoke alarm in each bedroom. If you live in a multi-story apartment building, plan as many exit routes as possible and remember to map the stairways in your building; never use elevators in an emergency! If one of your escape routes is on a second or third-story window, consider purchasing a safety ladder. The smoke alarm wakes you and your family. When you hear the alarm, roll out of bed onto the floor; get down on your hands and knees, crawl to your door and touch it with the back of your hand. If the door feels cool, brace it with your body and open it just a crack to check for smoke. If there is no smoke, leave using your planned escape route. Meet at a pre-arranged place – outside the home – for a head count. It is important to go over your fire escape plan with your family. Make sure everyone knows the local emergency phone number. Make sure guests as well as your family know the sound of your smoke alarm and are familiar with your plan of escape. Make sure babysitters practice fire and burn safety tips, especially the use of safety ladders, escape routes, fire extinguishers, smoke detectors and emergency phone numbers. Throughout the winter you must stay warm. Thanks to portable heaters this is made possible. To prevent a burn injury there are a few things you may want to know while bundling up. If you use portable heaters, provide AT LEAST three feet of clearance around them. Do not store newspapers, rags, or other combustible materials near a furnace, hot water heater, or space heater. Never use a stove as a substitute for a furnace or space heater. Never dry clothing or place anything combustible over a heater. Kerosene heaters should never be used inside the home; it is a violation of the fire code. Freestanding heaters should have a “tip-over” shut-off switch. Keep children and pets away from portable heating devices. Have chimneys inspected and cleaned before the winter begins. Keep a screen in front of the fireplace whenever a fire is burning. Be sure the fire is out before going to bed or leaving the house. Never use the fireplace as an incinerator. Materials such as wrapping paper and tree branches can burn suddenly and rapidly, throwing off dangerous sparks and debris! Thousands of scald burns occur annually, yet most are preventable! The two high-risk populations are children younger than 5 years and adults 65 and older. Continuous supervision of young children is the single most important factor in preventing scald burns. Increased awareness is the key to scald prevention! Cook on rear burners and turn pot handles to the back of the stove. Avoid wearing loose clothing around open flames and roll-up your sleeves. Open the microwave slowly and allow food to cool before eating; open food carefully to avoid scalds. Make sure that children and obstacles are out of your path before carrying hot liquids. When young children are present, avoid using tablecloths; keep hot foods in the center of the table. When preparing a meal, keep children out of the kitchen area. Never hold a child while handling a hot liquid. Turn down your water heater setting to 120 degrees Fahrenheit. Never leave a young child unattended in the bathroom or bathtub! Install special safety valves or remove the hot water handles in your tub/shower. Always test bath water with your hand or thermometer before bathing children; younger children have thinner skin than adults, making them more susceptible to burns. Crime has become a major concern for many Americans. For protection, many families have installed security bars on windows and doors. Unfortunately, these safety devices can become dangerous in the event of a fire. Properly prepare your home to keep your family safe. If you RENT your home and have locked security bars: Contact your landlord and ask him or her to replace the illegal bars with approved quick-release bars, (they can be easily released from the inside without the use of a key). If you OWN your home: Replace old security bars with the quick-release type. Practice exit drills with the security bars – preparation can save your life! Be sure that windows are not stuck, screens can be removed quickly and security bars can be properly opened. Know and practice fire escape plans monthly, and use them to identify and correct obstructions of windows and doors needed for escape from a deadly fire. 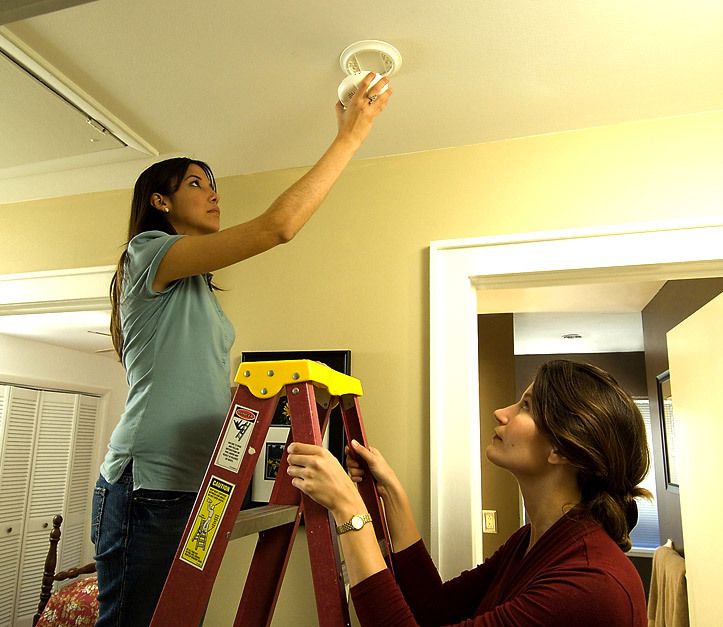 If a fire should occur, a smoke alarm provides the best protection against injury or death. It is estimated that 75% percent of older Americans who have died in a house fire did not have a working smoke alarm in their home. Are your alarms working properly? Place alarms on each level of your home, outside of all sleeping areas and inside each child’s room. Alarms should also be placed near dens, living rooms, family rooms and basements. Smoke rises; mount alarms on the ceiling or high on a wall. Cooking vapors or steam can set-off alarms; Install away from bathrooms and kitchen to avoid “false” alarms. Test alarm batteries monthly and replace weak ones immediately. Change the batteries at least once a year. If your alarm begins making a “chirping” sound, replace batteries immediately. Make sure all family members know what alarm sounds like and what to do if it goes off. If your sleep with your bedroom door closed, install a smoke alarm inside the bedroom. Adults who are deaf or hard of hearing should invest in alarms with strobe lights. Only use smoke alarms that are Underwriters Laboratories (UL) approved.